Massage is about you but I hope the information below will make you comfortable about my dedication to your satisfaction. Married to Julie since we were twenty-two. One of our three children, Geoff, designed my original website. 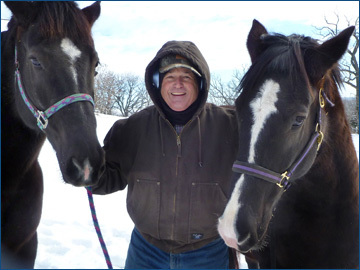 We live in the Galena Territory and share our home with five horses, three dogs and three cats. My background includes a BA degree with an English major with minors in Philosophy and Theology. I spent all of my career in Buying and Marketing Management, mostly at Sears Roebuck's national headquarters. 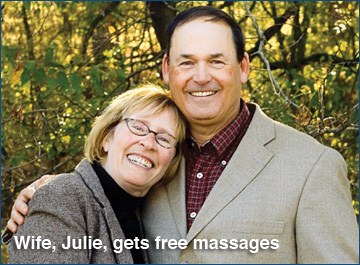 I used massage for stress relief in my last ten years of my career. I have had massages almost everywhere in the world that business took me: China, Hong Kong, Turkey, Pakistan, France, Spain and the United States. I was drawn to massage as a second career because it is a positive experience for the client and therapist – compared to the pressures of business performance careers. I was formally trained in massage at Capri College in Dubuque, Iowa. I am licensed by the State of Illinois (State License # 12121853). Neck, shoulders and lower back issues are my areas of concentration and expertise. I've spent twelve years developing techniques that address relief and relaxation here. I am capable of delivering any kind of pressure you desire from gentle to deep tissue and am fit enough to work eight hours for your group. I now have over twelve years of massage practice.